This speaker is the result of a year of research and development. We tested samples of 5 top selling powered speakers and the RPG series out-performed them all. These go louder and have punchier bass. What we found to be interesting was that some of the other speakers we tested against these were rated by their manufacturers at 1,200 watts or more, but they only went around half as loud as these. The 10" woofer built into this speaker has a 2" aluminum voice coil which provides an extremely loud, deep, punchy bass response. Couple that with our state-of-the-art 1.35'' Japanese made pure titanium-diaphragm compression driver and the ultra-wide dispersion, 40° large-format horizontal wave guide horn and you get beautiful full range concert-quality sound. The linear class A/B amplifier built into these speakers is efficient and provides clean power to the speaker. Some of the competing speakers use cheap amps in their speakers. We really went out of our way to make sure the amp built into these speakers gives you enough power so you can really feel and taste the music. The amplifier also has a clipping LED and a limiter to ensure long life to the speaker. The built in 2 band EQ will allow you to fine-tune and tweak the sound to your liking. The RPG10 has a versatile trapezoidal enclosure design which allows you to use it as a PA speaker or you can use the included mounting brackets and lay it on its' side to be used as a floor monitor. It is also flyable and stand mountable giving you many options on how you can utilize these speakers. We also included all the inputs and outputs you would need along with great controls. 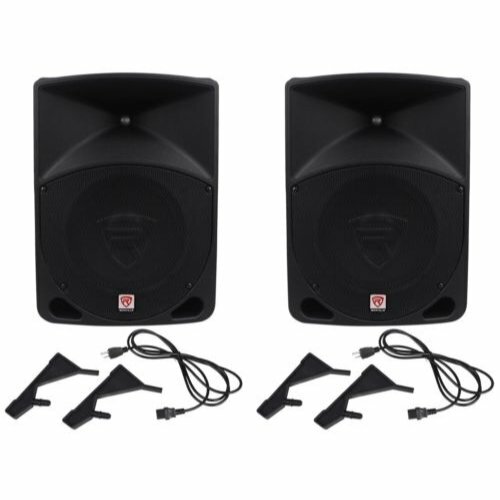 Pair Rockville RPG10 10" Active/Powered 1200 Watts DJ/PA Speaker System. 150-Watt RMS / 300 Watts Program Power / 600 Watts Peak. High power long-throw 10'' woofer with 2" aluminum voice coil provides incredibly deep bass and acoustic power. Frequency Response: 45Hz-20KHz. Maximum SPL @1w/1m: 122dB peak / 119dB continuous. Ultra-low noise Mic / Line input via XLR & 1/4-inch stereo jacks with volume control. Line RCA and XLR input with separate Gain adjustment. Additional balanced line output via XLR for linking of additional speaker systems. Versatile trapezoidal enclosure design allows different positioning. Flyable and stand mounting with 35-mm pole socket. Ergonomically shaped handle for easy carrying and setup. High-quality components and exceptionally rugged high impact ABS construction. Amplifier clip limit LED indicator & power LED cabinet rear. Front display power meter Blue LED. 110 / 220 Volt switchable power supply with external user serviceable fusing. Dimensions : 14.21" X 10.87" X 19.72".